Boko Haram Begins Ceasefire Talks With Buhari Government? 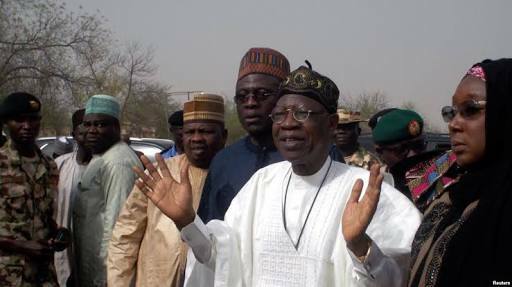 The Federal government is in talks with Boko Haram about a possible ceasefire, Minister of Information and Culture Lai Mohammed said yesterday. According to him, the talks have been going on for some time. "unknown to many, we have been in wider cessation-of-hostility talks with the insurgents for some time now. “The talks helped to secure the release of the police officers’ wives and the University of Maiduguri lecturers recently. The talks did not stop thereafter. Therefore, we were able to leverage the wider talks when the Dapchi girls were abducted." He did not give details of the talks. The popular thinking is that it is likely that the government has been discussing with the Al Banawi faction, which is believed to have abducted the Dapchi schoolgirls. The minister said the Federal Government would reinvigorate national security to prevent further abduction of school girls in the Northeast. He said efforts to bring back the remaining Dapchi and Chibok girls safely through negotiation and dialogue would be intensified to draw the curtains on the sad episode. Mohammed said the early release of abducted Dapchi girls had rekindled public belief in the government’s ability to rise to the occasion in the period of emergency. He said: “This Administration remains committed to the fight against terrorism and insurgency. The security services have since been directed to put in place further measures around all schools vulnerable to attacks to ensure the safety of pupils/students and teachers and school workers. The President has also tasked all the security agencies to work to ensure that we do not witness any recurrence of these incidents. The minister lamented what he described as the politicisation of security by the opposition, urging the media to refrain from disseminating materials that may sabotage efforts to end the insurgency and secure the release of remaining girls.